In accordance with the Companies Act 2014, Section 353, a small or micro company may choose to file abridged accounts with Companies Registration Office (CRO). When preparing a set of abridged accounts for filing purposes, the Companies (Accounting) Act 2017 amended the Companies Act 2014 to allow the directors’ report and the profit and loss account to be excluded. 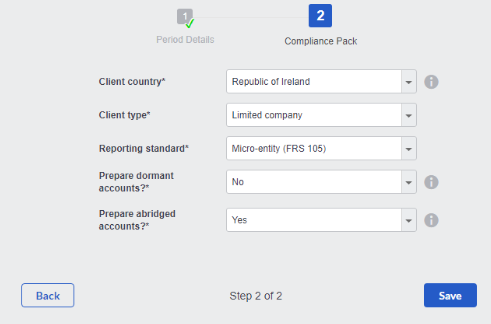 This option can be amended at any time by selecting Set of Accounts Options > Period Options > Compliance Pack. A statement will be added to the foot of the balance sheet regarding the adoption of the abridgement exemption. The Directors Report is not required for micro company accounts and as such we exclude this from the set of accounts prepared for CRO regardless of whether accounts are abridged or not. The sets of accounts prepared for Members and for Revenue will remain unchanged.